VAHMS is Now Accepting Event Submissions for explorASIAN May 2016! 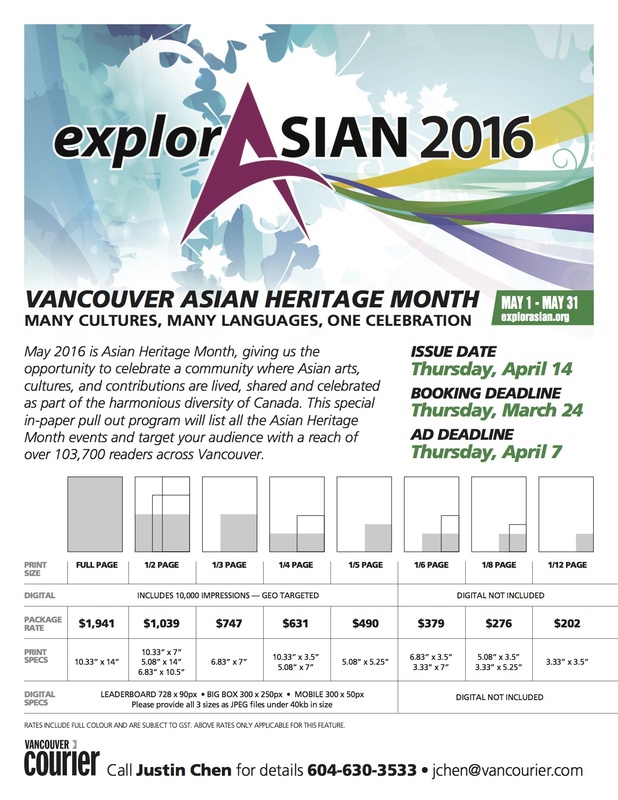 Our Submission Form is now live online, and the Vancouver Asian Heritage Month Society is officially accepting event submission for the explorASIAN May 2016 festival! Below are some helpful guidelines for the submission process. 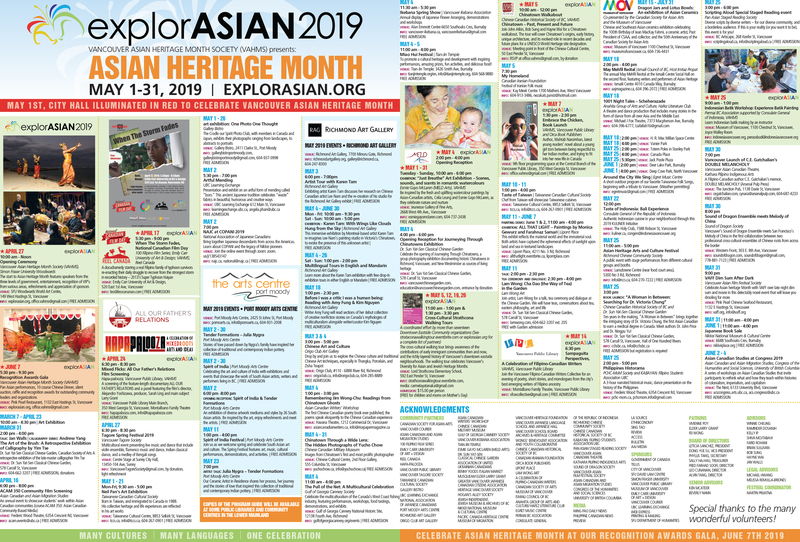 Vancouver Courier program guide for the explorASIAN 2016 Festival. We regret that we will not be able to accept any late submissions. print media sponsor, the Vancouver Courier, the cut off date for booking is Thursday, March 24th, 2016. The final ad will be due on Thursday, April 7th, 2016. (See the Advertising Rates sheet for rates or contact the Courier’s Justin Chen at 604-630-3533 or at jchen@vancourier.com for details). Events should be accessible to everyone in the community; please ensure there are English translations or explanatory remarks in English for your program. Promote and circulate the explorASIAN Festival program guide through your networks. Our Recognition Gala is the final event and our only fundrasier during explorASIAN. This June 11th, 2016 we need your support so we can continue supporting you. Please buy tickets to our Recognition Gala fundraiser at the end of May, donate items to the silent auction/raffle, or become a group or individual member of VAHMS to help us continue the festival. Attend the grand opening of explorASIAN Festival from 10:00 am to noon on April 16 at the SFU Woodwards, Djavad Mowafaghian World Art Centre, in downtown Vancouver. Complete and submit a feedback form in June following the explorASIAN 2016 festival to assist VAHMS in our accountability to funders. If you would like your event also promoted on our website, please see here. If you are a new partner, please let us know if you need help and support. And please specify what kind of help might be needed. Note: we are unable to provide financial assistance. Please send your submission form to VAHMS coordinator, Eleanor Munk, at office.vahms@explorasian.org for the selection committee to review. Someone from VAHMS will get back to you for further discussion as necessary. Deadline Reminders: the deadline is March 1st for inclusion in the May program guide that will be printed in the Courier. If interested in optional advertising opportunities with the Courier the cut off date for booking is March 17th, 2016.